Cancun, Quintana Roo, October 25th, 2010 – The Caribbean paradise of Cancun attracts tourists year-round with its sunshine and breathtaking turquoise waters. But during November, the destination lights up with vibrant colors, music and mysticism to celebrate the traditional Day of the Dead, “Día de Muertos”, or as it is known within the Mayan tradition, “Hanal Pixán”. While the popular holiday of Halloween is celebrated on October 31st, with costume parties and haunted houses, Mexico celebrates the Day of the Dead on November 1st and the 2nd. The tradition suggests the belief that between October 31st and the day of the celebration, the souls of the dearly departed roam the earth to enjoy the pleasures they had in their earthly life. The holiday is meant to honor those who have passed, and celebrate their life. As a result of the mixing of cultures and their Catholic and Mayan antecedents, the days of the dead are a time of great family togetherness in which the whole family take part and everyone is involved. 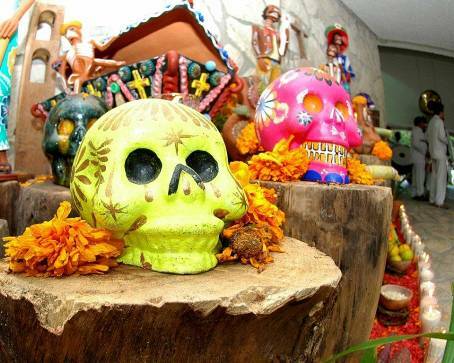 Throughout the state of Quintana Roo, “Hanal Pixan” -as the Day of the Dead is known within the Mayan tradition- is one of the most significant traditions, due to all the preparations involved: the building of beautiful altars, adorned with palm crosses, candles, drinks, pictures and the “deceased’s” favorite food comes to life. During “Hanal Pixan”, people pray and sing, sweep the yards and paint the walls to receive the dead with full honors. Gastronomically, “Hanal Pixan” is a celebration that bursts with flavor. Large portions of the best dishes are prepared, with the idea that the souls enjoy earthly pleasures such as food. Proof of this is the Mucbipollo, from the Mayan “Pib” which means “buried” and is a tamale or corn cake stuffed with chicken, sauce, broth and spices, cooked in a hole in the ground and covered with banana leaves. All the food is arranged on the altars for the souls to have their feast. The belief dictates that the offered food looses its flavor and nutrients by the next day. All these customs and traditions can be experienced in Cancun throughout the 5th Festival of Life and Death Tradition, created by Xcaret Park. This Year, the state of Chiapas will be added to the event as a special guest, offering a display of their artwork, music and crafts used to celebrate this holiday. The 33 communities participating in the event, share with tourists their traditions and beliefs from a first hand experience through theatrical performances, concerts, gatherings, games and more than 200 activities in 13 different forums. The 685 artists performing have gathered a wealth of stories, tales and legends under the theme “200 years of life and death” as part of the bicentennial year of Mexico’s independence. Day of the dead was declared in 2003 as a World’s Cultural Heritage Site by UNESCO, due to the importance it has on Mexican indigenous communities’ everyday lives regarding the different dimensions and perceptions of death. The Cancun Convention and Visitors Bureau invites visitors to take part in the tradition that surrounds “Hanal Pixan” “Feast of Souls”, from the number one tourist destination in Mexico. We will be visiting Xcaret Park this weekend. It will be the third time that we visit it.